Excellent way to send bulk sms from windows based Pocket PC, PDA and Smart phones to any GSM or CDMA mobile handsets using Pocket PC to Mobile text messaging software. SMS sending utility have capability to broadcast group sms at both national and international mobile networks. Bulk sms software is easily installed on any windows based mobile phone and user can send thousands of text messages without requiring internet connection or any external hardware or software device. Cost Effective text messaging tool enables user to send sms like personalized sms, job alerts, business meetings, marketing info, special offers, event reminders and much more to one or group of people in just easy clicks. Software helps business employees who always need to keep in touch with marketing news and other related information even when travelling and away from Home or Office PC. Utility is the economical and reliable business advertising tool in comparison to costly Radio networks, Newspapers, Televisions and Magazines. 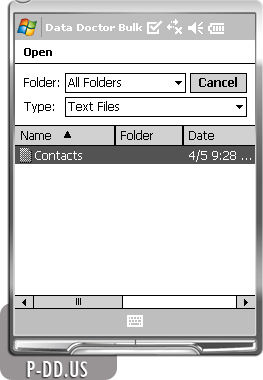 Send group text messages directly from Windows based Pocket PC, PDA and Smart phones. Send bulk sms to single or multiple users’ mobile phones at the same time. No internet connection is required to send the SMS at both national and international networks. Easily installed and run on Windows OS machines without affecting the system performance. Facilitate with sent messages history with date and time. Capable to reach large/mass audience located worldwide in minimal time. Simple to access and use provided with user friendly GUI interface.